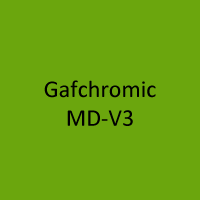 GafChromic MD-V3 radiochromic dosimetry film is designed for the measurement of absorbed dose of ionizing radiation particularly suited for high-energy photons. The structure of GafChromic MD-V3 radiochromic dosimetry film is shown in Figure 1. The film is comprised of an active layer, nominally 15μm thick, containing the active component, marker dye, stabilizers and other components giving the film its near energy-independent response. The thickness of the active layer may vary slightly from batch-to-batch. The active layer is sandwiched between two 120 μm matte polyester substrates.